BoyRaket.com: ZenFone Special Payday Sale! 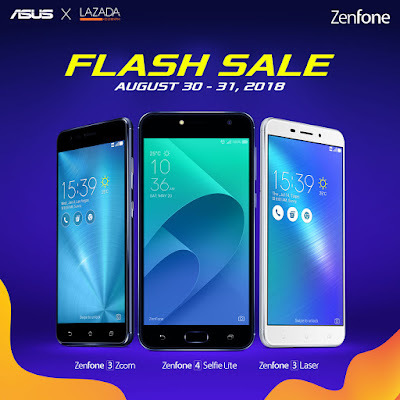 with Lazada’s biggest flash sale featuring your favorite ZenFone models! Payday weekend is soon coming, and what better way to celebrate it than with a Lazada flash sale, with your all-time favorite ZenFone models now available at lower prices! Just for 2 days, from August 30 to 31, ZenFans can get their hands on the most powerful variant of the ZenFone 4 Selfie Lite – a Lazada Philippines exclusive – for just PHP 6,395.00. With its 3GB RAM + 32GB Storage, users can experience smooth and worry-free operations! Moreover, with its 13MP front camera, selfies are sure to be crystal clear. In addition, ZenFans can also get the ZenFone 3 Laser for just PHP 6,795.00. Through its 13MP main shooter, users of this special ZenFone are sure to enjoy one of the best photography experiences a ZenFone smartphone can offer. And finally, the crowd-favorite ZenFone 3 Zoom will be offered with another special mark down that ZenFans can also avail of. For just PHP 10,990.00, fans can now catch the moment with its 12MP rear shooter that can cater up to 12x view; especially with its incredible digital-zoom technology. Without a doubt, this payday weekend is one that ZenFans can’t miss!